American food writer has a dual assignment in Beijing: cover a chef competition and deal with a paternity claim against her late husband. Maggie, 40, lives on a boat in L.A., adjusting to widowhood after her world-traveling lawyer husband Matt is hit by an errant motorist in San Francisco. She writes a peripatetic column about culinary Americana, but now Matt’s former colleague Carey has summoned her to Beijing: Grandparents are claiming Matt fathered their five-year-old granddaughter Shuying, and litigation looms under the (fictitious, alas) Children’s Rights Treaty. (Matt did have a brief fling with Shuying’s mother, Gao Lan, whom he met in a Beijing club.) 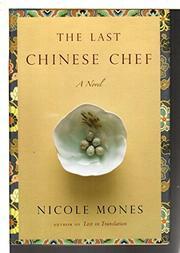 Maggie’s editor assigns her to profile a Beijing-based Eurasian chef named Sam, scion of the illustrious Laing clan. Sam’s grandsire Liang Wei wrote The Last Chinese Chef, the definitive treatise on cuisine based on centuries-old dining traditions at the Forbidden City, where the Liangs wielded woks. Sam’s father Liang Yeh fled China for Ohio during the Cultural Revolution. Now Sam has returned to carry on the family tradition under the tutelage of elderly mentors Jiang, Tan and Xie. Sam’s Imperial-style ancestral restaurant lost financing, but he is a contender in an upcoming culinary Olympic trial. If he wins a coveted spot on the Chinese team, celebrity chefdom is guaranteed. When Maggie journeys to the south to take a DNA swab from Shuying, Sam tags along to visit dying Xie, who alone can impart sufficient refinement to Sam’s wok chops. Maggie learns that another man is most likely the father, but after meeting Gao Lan, now a kept woman whose parents think the money she sends home derives from a career in “Logistics,” she resolves to help her anyway. As Sam’s audition banquet approaches, Maggie is increasingly drawn to him. Mones (A Cup of Light, 2002, etc.) has a subtle touch when portraying growing affection between genuinely nice people. Meticulously researched gastronomy will entice foodies, even those whose familiarity with Chinese food is limited to takeout. Warning: Avoid reading while hungry.